PRESS RELEASE: Palmer FAT50 tube series amplifiers are for the guitarist in search of the distinct and highly individual sounds only a true all-tube design can produce. Full of character, yet straightforward and uncluttered Palmer amps are back - with tons of tone, high quality components, rugged construction and attractive cosmetics to fulfill the demands of discerning players. The no-compromise FAT50 design incorporates a rainbow of sounds with punch and definition - from subtle crunch to maximum saturation, and a lively and dynamic clean tone with extended headroom. The FAT50's High Gain circuit provides massive overdrive for a comprehensive set list of quintessential riffs and classic lead lines. True to the no-compromise design there are no transistors in the signal path - even the effects loop is tube driven. 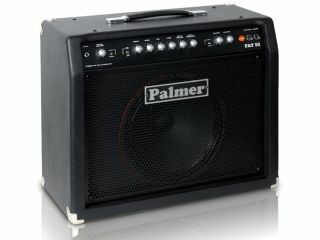 In addition to their outstanding sound quality Palmer amps offer unsurpassed reliability on stage and in the studio. Premium quality tubes are used throughout for safe and stable operation. With two footswitchable master volumes and a solid 50-Watts of true tube power, FAT50 amps are built to be heard.